I know, I said I would have more time to blog on this ship and then look what goes and happens! So I came to Celebrity Silhouette, to get away from Allure, but also specifically this ship because of Deep Blue Studios. Deep Blue is the ‘Picture This’ of Celebrity if you were following my previous posts. It is a high end photo option that gives the guests a one hour photoshoot, in a private studio, around the ship or on location. It is run by one photographer as a separate business so the key qualities of this position are being a very good photographer and post-producer because these images have a certain look to them, being business minded and being self motivated. A lot of people told me to go for this position so I came here and started annoying Gary, the then DBS, right away. Two cruises in and Gary gets news that he’s going to move to another ship to be Business Manager. Three cruises in and my manager tells me I’m going to take over the position when Gary leaves. Four cruises in, that was last week, my first cruise as DBS. I was pretty scared and overwhelmed. I had a lot to pick up but there are plenty of people on email for me to ask questions and I seem to be doing ok. That first cruise as DBS was also a head office visit so I really felt the pressure, but really everything seems to be going well. 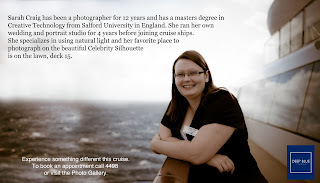 Here’s my little profile that’s on display to promote myself in the Gallery. As DBS I don’t take any of the regular photographs- ressi, gangway, portrait studios, and I don’t make any commission from photo sales. I only make money (on top of a basic) if I sell my work. I am supposed to sell in packages but last cruise I only managed to get people to buy a few prints but the prints add up and I did make more than I would’ve as a regular photographer and that will always be my personal goal. However this current cruise is proving bad for all revenue departments and I’m going to be lucky to sell anything. But if I’m not making money I have more time instead, so I’m catching up with my blog and films. I watched Hanna last night, what a beautiful film! Next cruise covers Christmas and New Year and has a lot of kids, it should be a big one so cross your fingers for me. I also see Jr next cruise as we meet the Allure in St Thomas and I won’t have seen him for 8 weeks, it’s been really tough! I’ve really enjoyed the marketing side of Deep Blue, I’ve been designing leaflets and invitations but I don’t think I can share them, even though I have model releases, on here. However I can share my Labadee panoramas, I took these this cruise, even though the weather was bad, as I really want to shoot some guests on the beach next time!